A proposal to extend the hours of operation for OB’s two surf camps will be made at Wednesday’s OB Town Council meeting. And for some reason, OB’s lifeguards are making the proposal or request. Why? Why are our public servants and first responders – our lifeguards whom we support and cherish – why are they pushing for these extensions? We find this very curious … and wholly inappropriate. The OB Lifeguards are requesting consideration for a time change to the operational hours for the two surf camps in Ocean Beach. The proposed time change would add one additional hour to the current operational period. The current RFP lease agreement states that the maximum land-based hours of operation are from8:30 am to 5:00 pm, and that water instruction is permitted from 9:00 am to 4 pm. This proposal would allow in-water instruction to extend until 5:30 pm and beach use until 6:00 pm. The additional hour-and-a-half of in-water time could only be used for private lessons ranging from 1 to 5 students and would be implemented on a trial basis for sixty days. We have invited the surf camps to present their case and the OB Lifeguards are looking for community input and feedback on this proposal. This is not an issue without contention. Also on the OB Town Council agenda for Wednesday is update on the status of the OB Orchard Avenue Cliff Cave demolition from Councilmember Lorie Zapf’s Office. There will also be a presentation from the Alzheimer’s Association on the Take Me Home Program plus information, resources and tips to help you care for your loved one and yourself. Learn tactics on how OB can become more a more Alzheimer’s-Aware community. 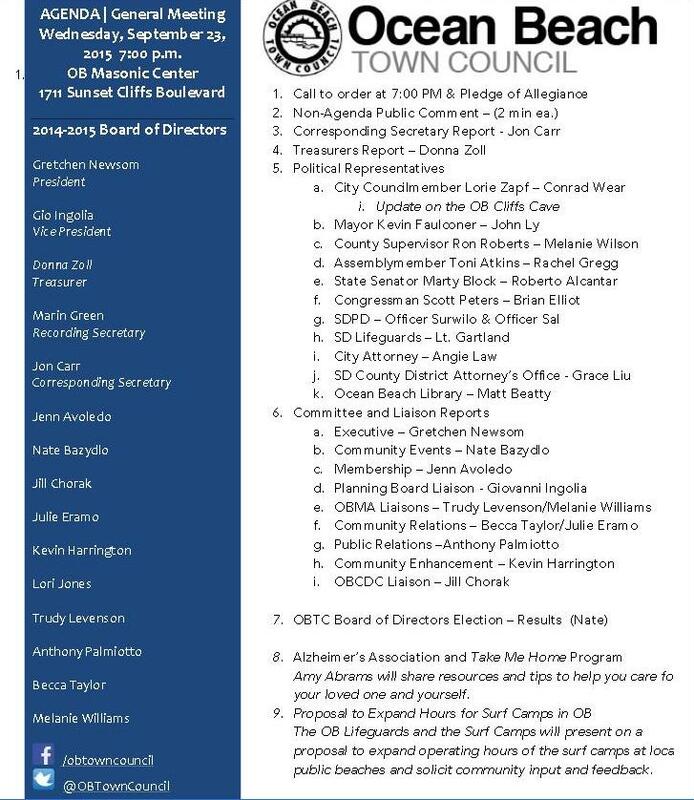 The OBTC meets at the Masonic Center, 1711 Sunset Cliffs Blvd, at 7pm. We ripped the graphic right off the OBTC website. wow, there’s a new artist on board. I see a similarity between home-operated businesses and businesses that operate on a beach that borders a residential area. Perhaps we should be using the rules for home- operated businesses a guide for how the surf schools operate. I don’t what the current rules are. Surely someone on the Town Council would know. The rules involve signs, advertising, hours of operation, and nuisances like noise, smells, and parking. I think it’s a fair starting point for negotiations. This is also a bigger issue. A state issue. Personally I’m concerned about the affordability of the beach experience, and I think the California Coastal Commission should be concerned as well. At the local level, I think we should leave a placeholder for surf schools that are non profit. We shouldn’t saturate a beach with for-profit schools. We need to leave room for the non profits…even if they don’t currently exist. The additional hour-and-a-half of in-water time could only be used for private lessons ranging from 1 to 5 students and would be implemented on a trial basis for sixty days. Did you catch a whiff of Uberism when you read that? I sure did. It looks like the schools want to capture a segment of customers before other private contractors move in on their action. Technology now allows for the proliferation of the stealth surf school…marine mentors and coastal consultants. Perhaps that’s what the lifeguards want to avoid. Maybe they they think it’s easier to manage just two colors of surf schools at South OB. I’m tired of the moms in their Escalades, Lexus, Mercedes etc. mini vans that park in the red I front of Saratoga park, and drive down my alley way to fast! Along with the surf vans parked illegally The parking and lack of respect for OB is disheartening! thanks for reading my rant ? Why are instructors allowed in a “surf only” zone? They don’t have boards. I can’t go out and push my kid’s into waves there (not that it’s a great idea). Why can they?